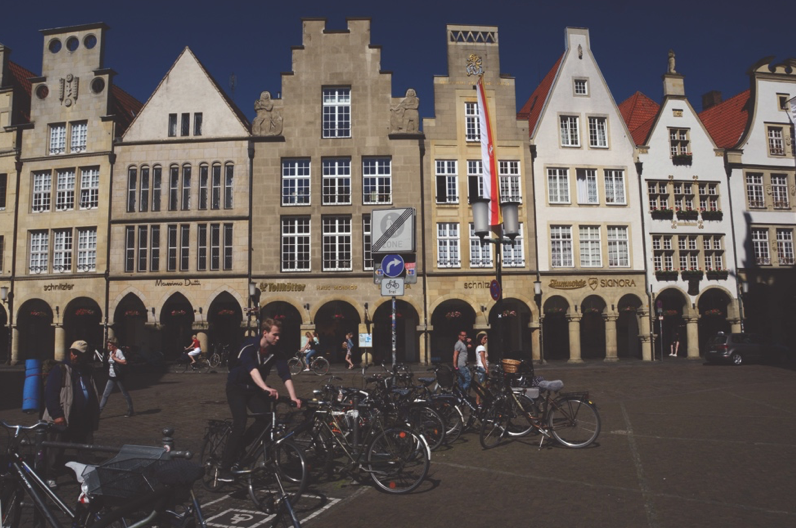 Figure 14-1: Several streets in the center of Munster are reserved for pedestrians, bikes and buses. In 2004, LivCom named Munster as the most livable city on earth in its size category. This city of 300,000 people, 250 miles west of Berlin, was also named as the Climate Protection Capital of Germany in 2010 and Germany’s Bicycle Capital in 2014. In 2010-2011, Munster was a finalist for European Green Capital. 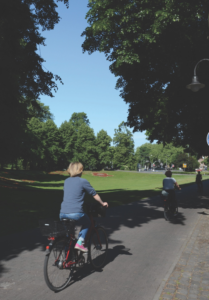 Although Stockholm and Hamburg won that competition, the European Green Capital judges were particularly impressed with Munster’s commitment to ecomobility and its evolving network of interconnected greenbelts and green wedges. Munster adopted a green structure policy in 1965 that continues to guide development as well as the promotion of greenspace, recreation and biodiversity. The green structure consists of three green belts and seven green wedges that place roughly 95 percent of the population within 300 meters of greenspace. Munster created its inner green belt, the Promenade, on the site of the former fortifications originally surrounding the historic city center. The Promenade’s formal landscaping design features lime trees that shade a walking path and separate cycle track, encouraging ecomobility as detailed below (Munster, 2009). Munster’s most prominent green wedge follows the Aa River. Narrow paths and footbridges allow pedestrians to traverse the entire city center with the Aa River often by their side. Once outside the downtown, the City has built its most prominent park on the river banks and attracts visitors with boathouses, museums and a zoo as well as a landscaping design that retains woodlands and wetlands. The other green wedges include a restored 19th Century park, the corridor of a renatured stream and the transformation of a former military range into Peace Park. Munster is not content to rest on its sustainability accomplishments. Between 1998 and 2008, the City grew its green areas by ten percent (Munster, 2009). The green structure also connects greenspace within the City of Munster to the Munsterland park landscape, a 6,000-square kilometer cultural landscape characterized by churches, monasteries and moated castles dotting a countryside of hedges, meadows, fields and woods. Despite being actively farmed, the Munsterland park landscape creates habitat for a large diversity of species as well as recreation for locals and tourists (Munster, 2016a). From the heart of Munster, cyclists can follow a 960-kilometer route through Munsterland linking over 100 historic manors, country estates and castles (Munster, 2016a). Figure 14-2: The Promenade, a tree-shaded bike-pedestrian path, completely encircles Munster’s historic center. 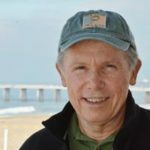 Munster has fully embraced “ecomobilty” as its transportation goal as well as the shorthand description of its emphasis on walking, public transit and particularly bicycling. Munster has made it safer to pedal by adopting a 30 kilometer per hour (19 mph) speed limit on all residential streets. The City has 450 kilometers of cycle paths in addition to 255 kilometers of cycle paths off of main roads (Munster, 2016b). Many of these cycle paths radiate from the Promenade, the 4.5-kilometer multi-use path completely encircling the city center. 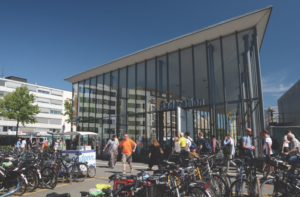 The Promenade is also located less than 1,000 feet from the Munster train station and the Radstation, Germany’s largest bicycle garage, offering bicycle repair, sales and lockers as well as 3,300 bike boxes. From the Promenade, cyclists arriving by train or directly from home can navigate to downtown streets that are reserved for buses, pedestrians and, of course, bicyclists. Not surprisingly, 37.6 percent of all trips in Munster are by bicycle, with another 15.6 percent occurring on foot and 10.4 by public transportation. At a mode split of 36.4 for motor vehicles, more people in Munster travel by bicycle than by car (Munster, 2009). “City of short distances” is Munster’s land use mantra. To achieve its goal of “inner development before outer development” Munster has built one-third of its new housing on infill sites and initiated the conversion of 250 hectares of former port and military facilities. For example, between 2005 and 2007, 62 percent of all new multi-family residential units were built in these redevelopment opportunity areas (Munster, 2009). Some of these developments have been recognized as models of sustainability, such as Car-Free Garden City Weissenburg, a residential complex on the site of former military grounds. Weissenburg features substantial open space, green roofs, total rainwater recycling and energy-saving building design (Munster, 2016c). In addition, the development is car free. Weissenburg residents cannot own cars but instead rely on buses, bicycling and a car sharing station located at the edge of the development. Weissenburg abuts a cycle track linked to Munster’s extensive bicycle network; consequently, over half of its residents bike to work and 67 percent shop by bicycle (Baumer, 2009). Green structure, ecomobility and infill development accomplishments together helped Munster reduce carbon dioxide emissions by more than 20 percent between 1990 and 2005 and position the city to reach its target of achieving a 40 percent reduction by 2020 (Munster, 2009). 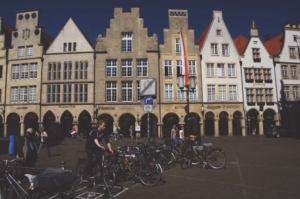 In 2015, Munster won another battle against climate change, becoming the first German city to divest its pension fund of oil, gas and all other fossil fuels, explaining that such investments are incompatible with the City’s climate protection goals (Mattauch, 2015). Baumer, Doris. 2009. Living in Car-Reduced and Car-Free Residential Areas: A Promising Approach to Create Livable Neighborhoods and to Foster the Choice of Sustainable Means of Transport. Dortmund: ILS-Research Institute for Regional and Urban Development gGmbH. Munster. 2006. Improving the landscape: The Munster green space ordinance. Retrieved on 2-29-16 from http://www.muenster.de/stadt/livcom/index244.htm. Munster. 2009. The Munster Application for the European Green Capital Award. Munster: City of Munster. Munster. 2016a. Cycle tours in and around Munster: Route of 100 Castles. Retrieved on 2-29-16 from http://www.muenster.de/stadt/tourismus/en/bicycle-tours_100-castles.html. Munster. 2016b. Cycling Capital. Retrieved on March 2, 2016 from http://www.muenster.de/en/cycling_capital.php. Munster. 2016c. Car-free Residence – Gartensiedlung Weissenburg. Retrieved on 2-29-16 from http://www.muenster.de/stadt/exwost/practice_I1.html.